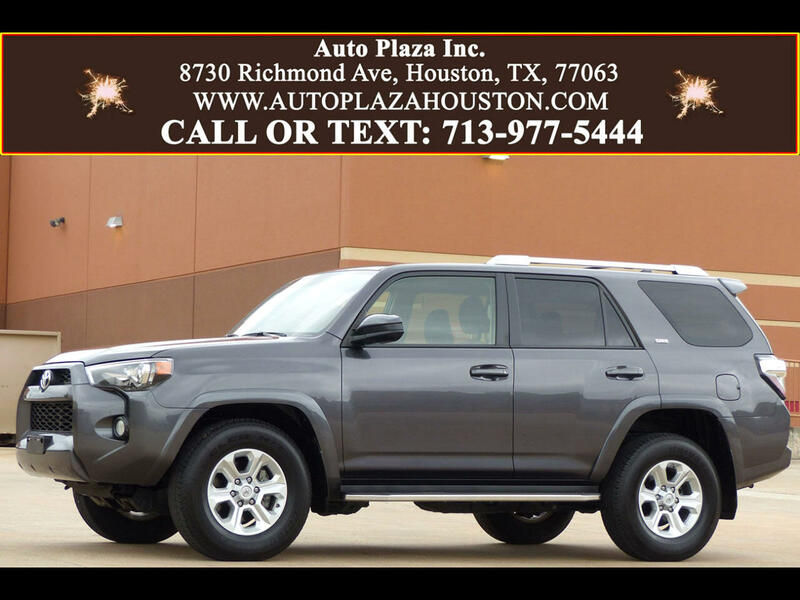 Used 2018 Toyota 4Runner SR5 2WD for Sale in HOUSTON TX 77063 Auto Plaza, Inc.
With Remaining Factory Bumper to Bumper Warranty Good Thru 11.17.20 or 36k Miles!! Have You Been Searching For Something that is Reliable, SAFE, Solid, and Spacious? Presenting to you this Low Mileage ONE OWNER 2018 Toyota 4Runner SR5 With a Slick Automatic Transmission!!! Options Include, Navigation, Backup Camera, Premium Entune Audio Package, CD/MP3 Player, AUX/ USB Audio Input, Bluetooth Handsfree Integration, Power Seating, Towing Package, Luggage Rack, Running Boards, Phone and Audio Controls on Steering Wheel, Tilt and Telescopic Steering Wheel, Power Sliding Rear Window, Automatic Climate Control with Rear Air Vents, 17" Alloy Wheels, Traction Control, Vehicle Stability Control, Fog Lamps, Cruise Control, Power Heated Mirrors, Power Locks, Dual Front Passenger Airbags, Side and Curtain Airbags, Intermittent Windshield Wipers, and More! This 2018 Toyota 4Runner gives you a Safe and Pleasant Ride. So, CALL TODAY to Schedule a TEST DRIVE!!! Financing Available!